The Museum of Greek History of Pavlos Vrellis is a museum of waxworks. 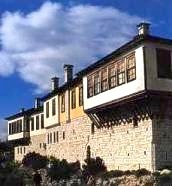 It is housed in building of traditional architecture of Epirus and has 36 collections of sculpture, with 150 waxworks totally σε φυσικό μέγεθος, μέσα σε όγκο 2.500 c.m. The waxworks and the collections of the museum refer to the 2.500 years of greek history. There are collections with sunbjects from ancient Greece, Byzantium, the greek revolution of 1821, the Macedonian war, the war of 1940, etc. Please see more information about the museum, P. Vrellis and the history of the museum at the web site: www.vrellis.org.